*Self-identified as belonging to a racial or cultural group other than “White” (does not include Indigenous). 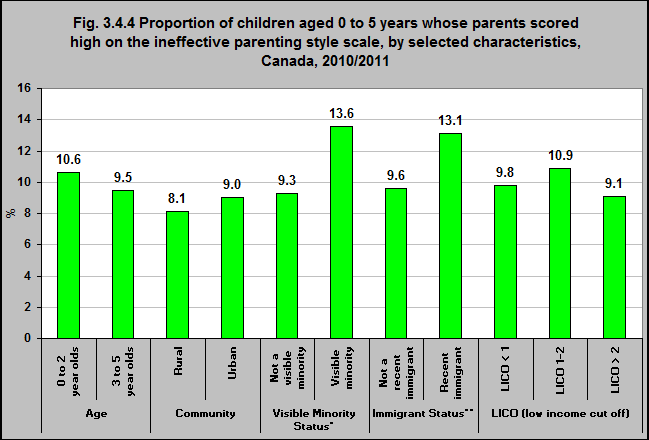 In 2010/2011, younger children were more likely to live in families where their parents scored high on the ineffective parenting*** style scale. This was also the case for children who were part of a visible minority group and children who were recent immigrants. There was little difference based on income and community (rural/urban). ***The National Longitudinal Survey of Children and Youth (NLSCY) and Survey of Young Children (SYC) measure effective parenting by looking at how parents communicate with and discipline their children.